Preemption is a dangerous concept in Pennsylvania that gives gun groups unprecedented power over cities. It means that all gun regulations must be enacted by Harrisburg. There has been an effort to pass super or expanded preemption, what we also call punitive preemption. This would allow membership organizations like the NRA (as well as folks who may have never set foot in these towns, let alone suffered a provable harm as a result of the local firearms laws in question) to sue any town in Pennsylvania that enacts its own firearms regulations. In 2014, the legislature passed and Governor Corbett signed Act 192, implementing expanded preemption. 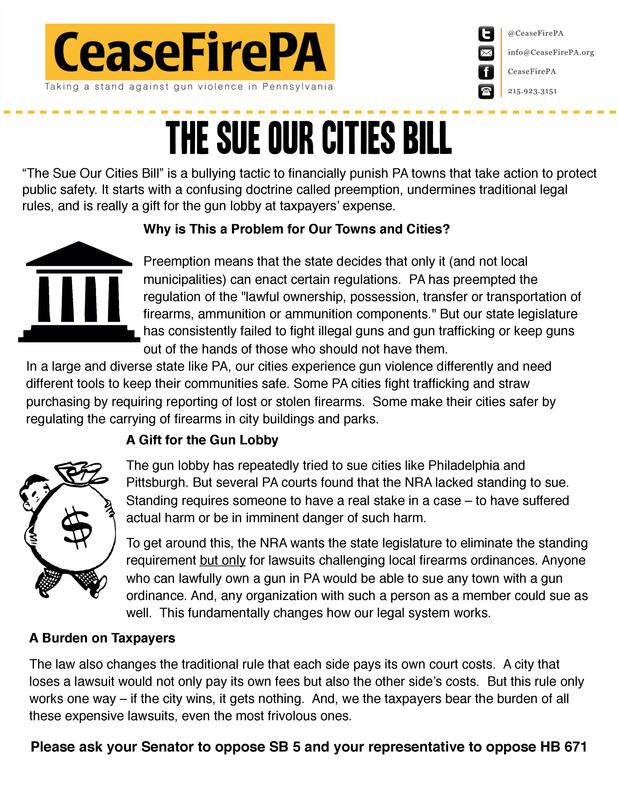 During the limited time this law was in effect, lawsuits challenging local ordinances about guns in parks, reporting of lost and stolen firearms, and carrying firearms during a state of emergency were filed against the cities of Philadelphia, Pittsburgh, Lancaster, Harrisburg and Lower Merion. In 2015, in a lawsuit organized by CeaseFirePA, the Commonwealth Court struck down Act 192 on the grounds it was passed in violation of the PA Constitution. In 2016, the Supreme Court affirmed the decision. Since that time, the legislature has been unable to reenact a punitive preemption bill. “The Sue Our Cities” Bill does not, as purported, “clarify” or expand the doctrine of preemption. Instead, it undermines the age-old concept of legal standing, which is quite literally the bedrock from which lawsuits originate. To have standing, one must have suffered a harm or be in imminent danger of suffering a harm. Here’s an analogy. In this example, “you” are a municipality and the “icy sidewalk” is a local law. Under the current universally-accepted rule of legal standing, someone on the other side of the street can’t sue you just because you have an icy sidewalk; instead, he or she needs to slide on your icy sidewalk and sustain a provable injury (a broken arm, for example). This precludes people who have suffered no loss from recovering damages. Under “The Sue Our Cities” Bill’s new definition of standing, not only can that person from the other side of the street sue you without sliding on your sidewalk, but ALL OF THEIR FRIENDS ON THE OTHER SIDE OF THE STATE who have NEVER BEEN ANYWHERE NEAR YOUR TOWN, LET ALONE YOUR SIDEWALK can now sue you because they are angry that your sidewalk is icy. You don’t need to be a legal scholar to see that this is problematic and fundamentally wrong. To make this even more unbelievable and offensive, if your neighbor or any of your neighbor’s friends who are now suing you belongs to a so-called “membership organization” (ranging from a local knitting club to the Shriners to the KKK to the—you guessed it!–NRA), that membership organization can also sue you. But wait—there’s more. NOWHERE in these bills is there a limitation on the amount of lawsuits that can be filed against any town that has passed a “lost or stolen gun reporting” law or any other regulation. The punitive preemption bills also change traditional legal rules about fees and damages. Traditionally, each party to a lawsuit bears its own costs, unless the statute sued under specifically discusses fee shifting, which is then usually applicable to both parties. Under punitive preemption, if an individual or organization wins the lawsuit against the city, the city must pay for the winner’s lawsuit costs. However, the reverse is not true if the city wins. No matter what happens in the case, each municipality is on the hook for all of its costs associated with the lawsuit. Tell your legislators you want them to oppose expanded preemption and that you want your municipality to have the right to regulate firearms on municipal property and in municipal buildings.